"One of 10 Best Comics and Graphic Novels of the year." --The Onion"Great Graphic Novel for Teens"--Young Adult Library Services AssociationA great wall separates a magnificent metropolis from the surrounding countryside. All humans are banned from ever entering the city. A young girl is determined to enter the forbidden city in search of her lost brother. When she crosses over, fantastic adventures ensue in narrow medieval streets, ancient temples, and abandoned bazars of the haunted city. To save her missing brother, she must grapple with mythical creatures, explore the mystery of the missing inhabitants, and cure the amnesia of an entire civilization. "Over the Wall "immerses the reader in a richly imagined world of coming of age rituals, lost worlds and the nature of memory. The beautiful two-color art vividly brings to life the fantastical architecture of mysterious metropolis and faintly evokes the crisp lines of Japanese anime. 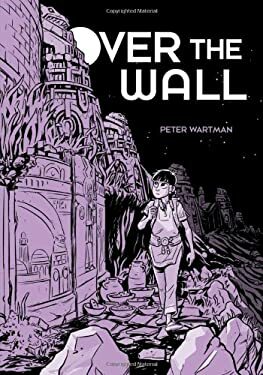 "Over the Wall" is a stunning debut from a young and talented cartoonist Peter Wartman.Peter Wartman is a designer by day and a cartoonist by night. He lives and works in Minneapolis, Minnesota. "Over the Wall "is his first graphic novel.